Mary loves crafts and when living in Hanoi visited many of the traditional craft villages close to the city. Every second weekend, when we lived in Hanoi, we hijacked the company's trusty Toyota and boogied to the boonies to discover new villages. Wikipedia was savaged, local tourist information was translated from an unknown language looking like English into workable tour guides. Thom, our trusty driver, did map research in advance to get a general sense of direction for places he has not yet been. In these visits, we also tried out the local specialties which can range from yogurt to tiny chicken or crabs in tamarind sauce. Some great cities are planetary systems where the satellites spin around the solar centre. Hanoi is one of these where the city is most easily seen but the small craft villages which spin in an orbit around it make the trip really worthwhile. In most cases, these were not set up for tourists, although they're becoming more tourist friendly. 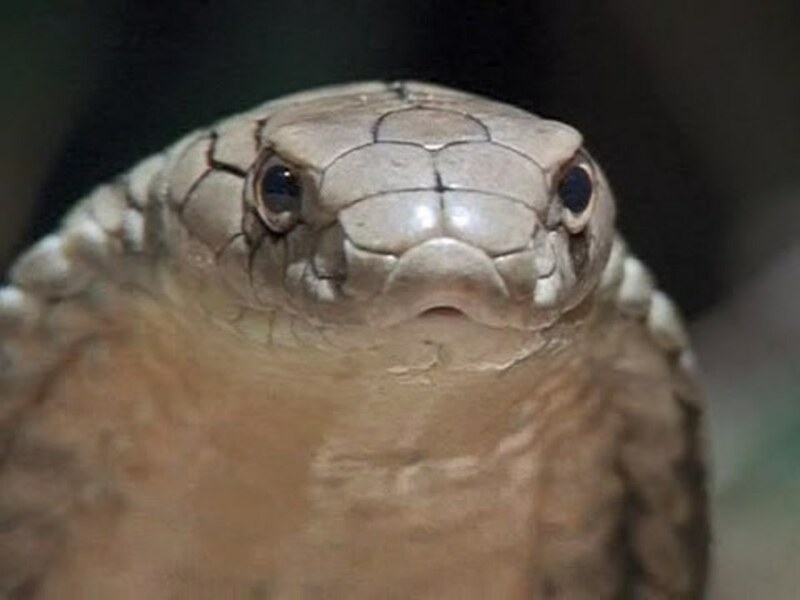 Most large Asian cities have learned from Singapore that if you destroy your history on the road to becoming an industrial power, you lose not only your soul but a major form of income through tourism and support of local crafters. The ancestors would be smiling today. The beautifully hand painted pottery of one village, the intense colours of the lacquer ware of another and the imaginative embroidery creations of a third are quite justifiably world famous. But beyond this, there's the silk village, and the woodcarving and the mother of pearl inlay which are models of thousand year old crafts. Do you enjoy visiting craft villages? Hanoi alone has over 50 traditional craft villages and they are worth visiting especially for those who are interested in traditional crafts. About 13 kms. 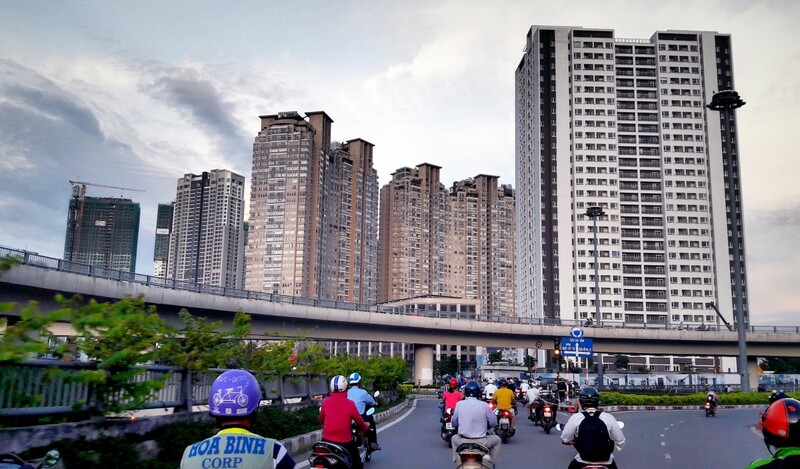 from Hanoi, Ba Trang has become a home to potters who settled here because of its white clay and also because of its proximity to the capital. After Tha Long (now Hanoi) was made the capital city in the 10th century, crafters came to supply the pottery needs of the growing population. 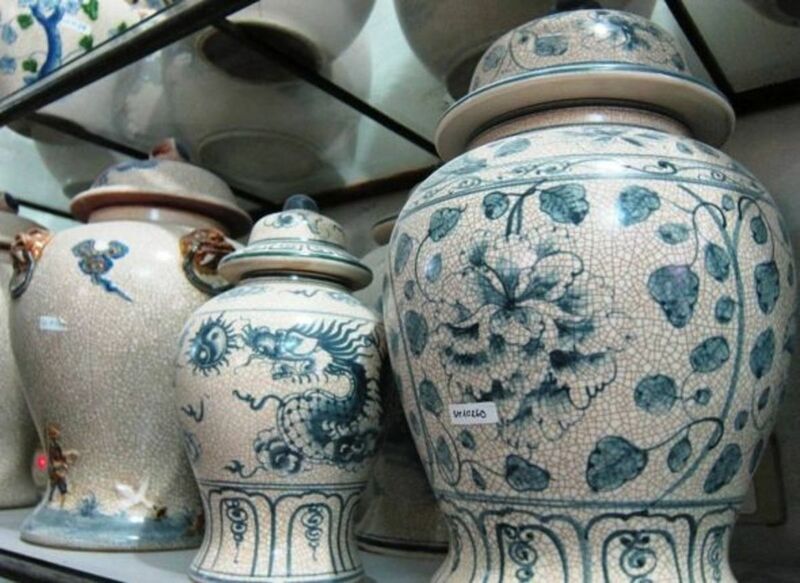 With such a long history of pottery, Ba Trang is now internationally famous and has become a popular destination for both local families and tourists from Hanoi. It is an easy taxi ride. The first time I went, I just took a cab and for $25, he brought me to the long line of stalls, waited for me for an hour and brought me back to my hotel. I went back again the second time and really had a good walk of the village and, with some Vietnamese young university students, tried my hands at making some ceramics. Have you visited any of Vietnam's craft villages? Here is a picture fully embroidered. So much work put into this. It's like a painting patiently put together, stitch by stitch. In our first visit, we arrived early and immediately, we liked what we saw. The village has not yet been staged for tourism so we enjoyed our walk in a fairly typical Vietnamese village. But we were not fooled by the tranquil atmosphere. As you peeked through the doorway of one of the opened houses, we saw the villagers busy working on their lacquer. Some were applying gauze on bowls, others were finishing products and others were immersing the lacquer items in water. 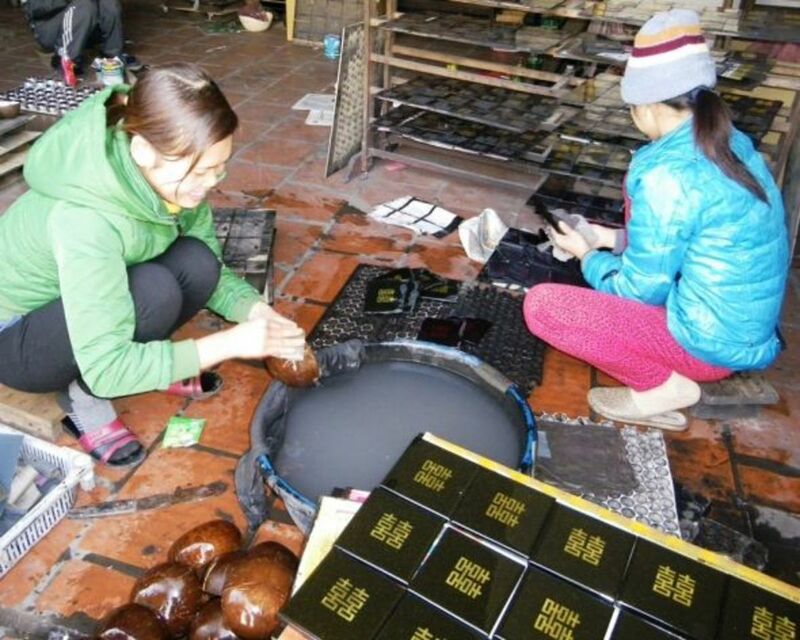 Lacquerware was drying everywhere and the workers squatting among their products were a wonderful sight. We went into one of the simpler production houses and as always, the ground floor surrounding the courtyard was the family home. The husband was finishing candle holders and his wife with two other young workers were busily immersing items in water. Displayed on the drying racks were many items of finished lacquerware which were soon to be sent to Hanoi or exported to other countries. The second courtyard was much bigger and it had a well organized display place with a big group of young women all busy working and obviously having fun at their jobs. It seemed to us that this village factory was exporting most of its products to Europe. In both places, we saw how labour intensive lacquer making is. We were told that the lacquer products go through as many as 20 steps and specific kinds of wood are used for different types of items. Three finishes can be applied individually or collectively in the Vietnamese lacquer making. These are surface painting, mother of pearl inlay or a wonderful eggshell application. Only hatched duck egg shells are used. With all of the different steps involved, the lacquerware can take up to 100 days before ready for export. Watch this video and find out where lacquer comes from. It is quite an experience to web right there and see for yourself how this is done. You don't have to go to Vietnam to own a piece of lacquerware. This lacquer box is beautifully crafted, hand painted on its lid with a dragonfly, the Vietnamese symbol for good life and luck. Perfect for storing your jewelry or other precious items. I have one that I put in the entrance of our home to store keys. They are also interesting decorative pieces that will brighten some corners in your home. 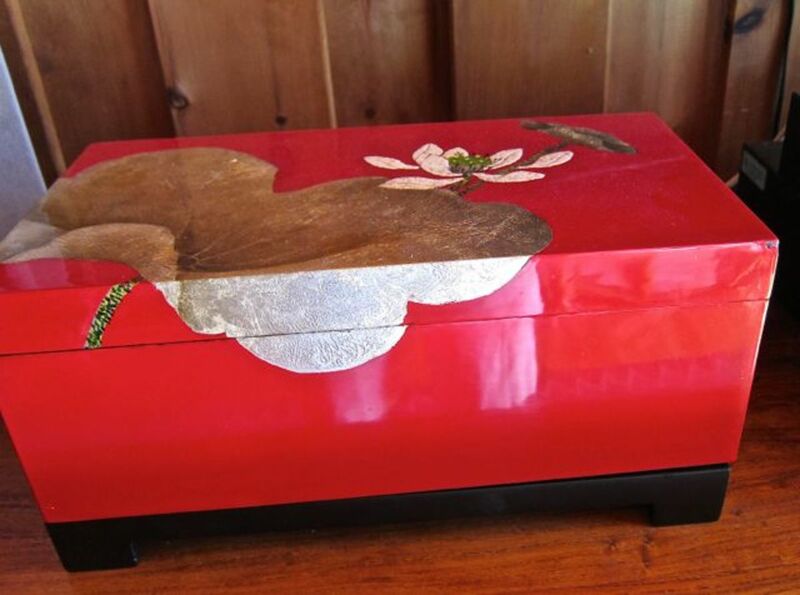 This red jewelry box is also a perfect gift for your friends, wishing them luck and prosperity, red being the colour for luck in many Asian tradition. 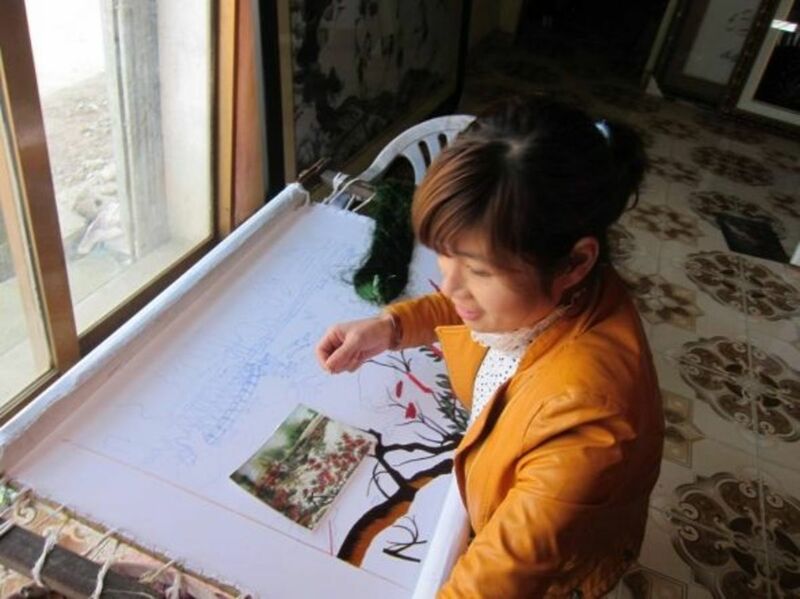 Started in Vietnam in the early Li dynasty (1009) by Truong Cong Thanh, the mother of pearl inlay craft now involves 95% of the Chuong Ngo's 1,700 villagers has helped many climbed out of poverty. Truong Cong Thanh, a master of literary arts, became passionate about this craft and gathered new ideas and innovations in his travels. 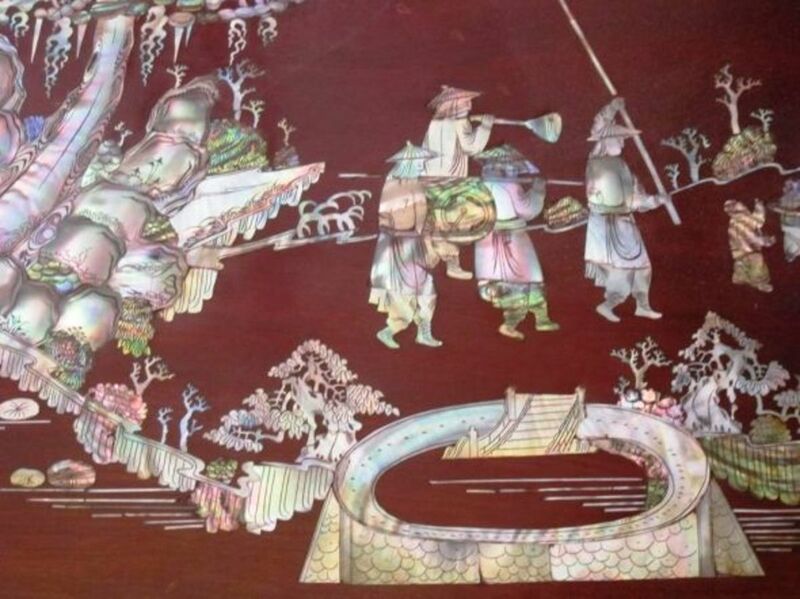 Some of the master craftsmen from this village produced trays and furniture for the royal court and so mother of pearl inlaid furniture became symbols of wealth. The intricate designs in some of this furniture takes a long to finish as many of the pieces are really tiny. 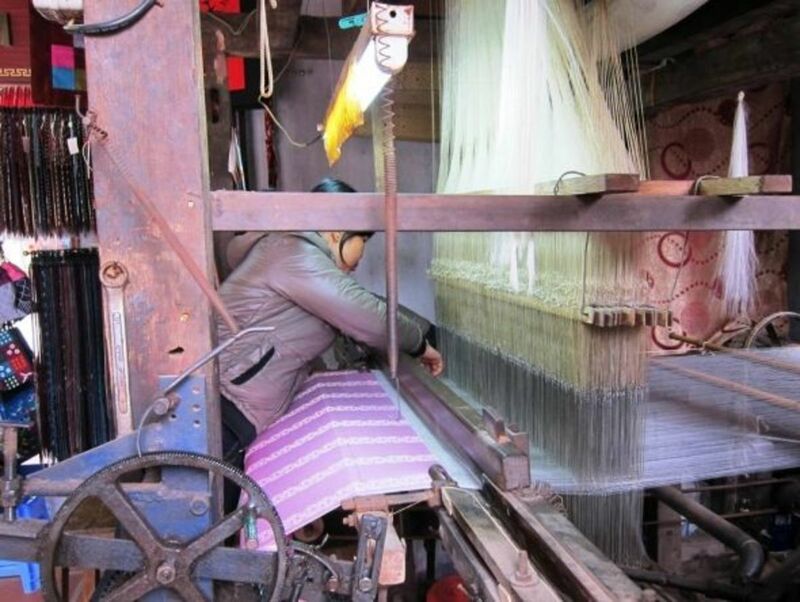 The village showcases the traditional looms used in silk weaving and a number still use these looms producing some of the best natural silk fabrics. 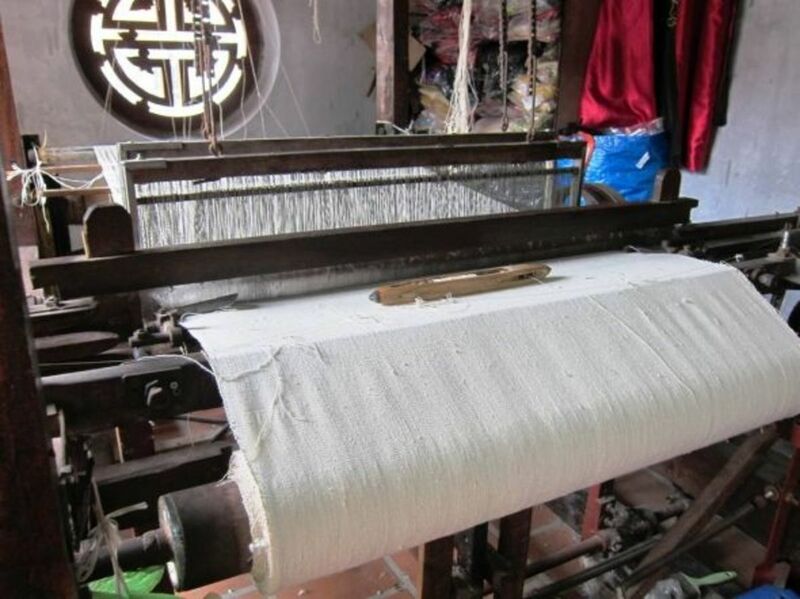 With two thousand of history in silk making, Van Phuc is the place to get silk souvenirs. The houses in the village have become stores selling all kinds of silk products. But look into some of the stores and you will find women still weaving silk in traditional looms. You can buy yards of these traditionally woven fabrics. This embroidery village is not really organized for tours. Many of the women do the embroidery at home while tending to the kids and the farm so they don't go to a central facility. There is a lady who has a store in the village for all the embroidery items and she has a group of about 40 women who do embroidery and sell these through her store. She herself is a master in embroidery and teaches these women traditional techniques and designs. As in other crafts, the best work is often for the temples. 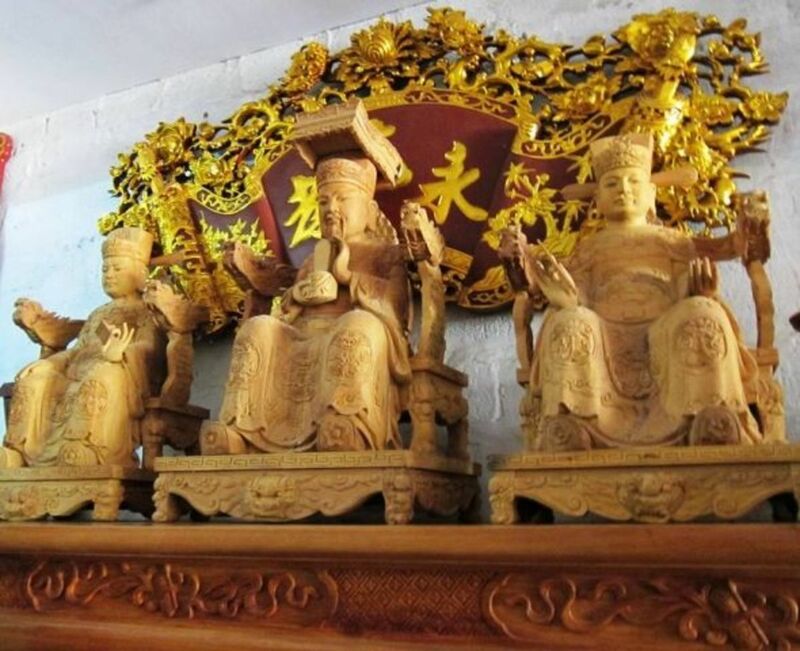 Huge pieces depicting the gods are frequently commissioned by rich people or by the temples themselves. Wood for these is carefully chosen from the best hard wood and can last for centuries. As mistakes are unforgivable, only the masters do these carving for the temples. Apprentices surround the masters and it's clear they start learning at a young age. If you want to learn some bamboo craft, go to this village. They have a cooperative and the workshop is quite well organized. The bamboo artisans there are really proud of the quality of their products and the innovative design they have developed. The bamboo products have gotten more attention and long term contracts now that people choose more environmentally friendly products. This place is closer to Hue so when you visit Hue, go to this place. In 2007, the local government started a cooperative and today, they have about 400 designs mostly of bamboo lanterns in various styles. The local artisans are happy to continue doing their craft and earning enough to support their families. Tell us what you think of craft villages - Tourist Traps? Some reviews online of craft villages think that these are tourist traps. Meanwhile, the government not just in Vietnam but in other countries as well encourage villages to join programs on one village, one craft or product as they enhance the income of rural folks and stop them from immigrating to the already overcrowded cities. It is also encouraging tourists to visit other parts of the country not just the major cities and tourist sites. Some craft villages, not necessarily in Vietnam, are established as tourist traps. Maybe, the crafts there are no longer done by village crafters to the utter disappointment of tourists who want to see the traditional villages doing the crafts. What do you think? Are these craft villages tourist traps? Craft villages - What do you think? Are craft villages tourist traps? Nothing like Hanoi shows well what Vietnam truly is, its soul and its dreams. Its tree lined streets, its Old Quarter surrounding the calm Hoan Kiem Lake and its misty days are now part of who we are having been in Vietnam for some months now. Touring some of the traditional craft villages around, you will have good picture of what life was years ago in Vietnam. 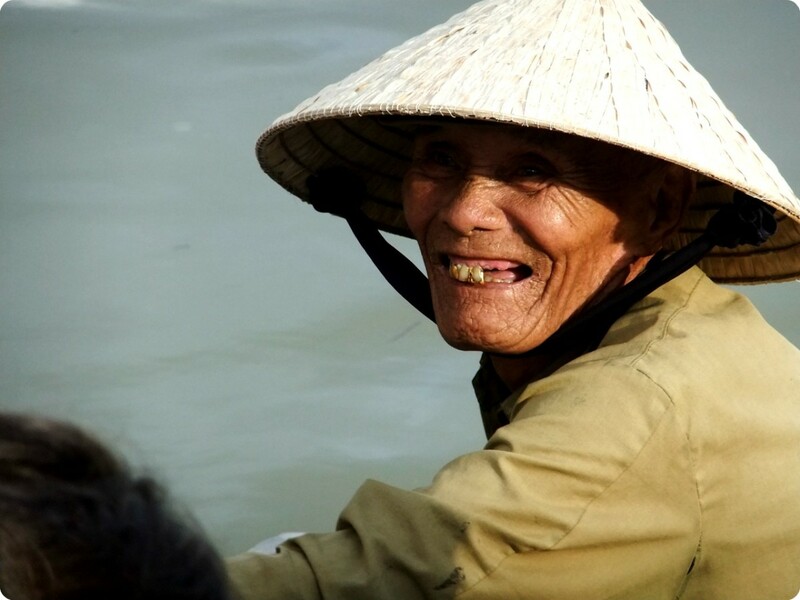 Did you enjoy your virtual visit of Vietnam's traditional craft villages? Yes, I have enjoyed your hubs on textiles. I remembered buying in Egypt the best cotton for my husband's shirts. A local friend told us where to buy it and it is until now one of his best shirts even if it has been well used. Thank you, Mary, for this interesting article. I love handicrafts, especially handmade textile and embroidery. I liked reading this article. Thank you Peggy. Yes, the Mother of Pearl are so thin and tiny that it takes time to make the design. 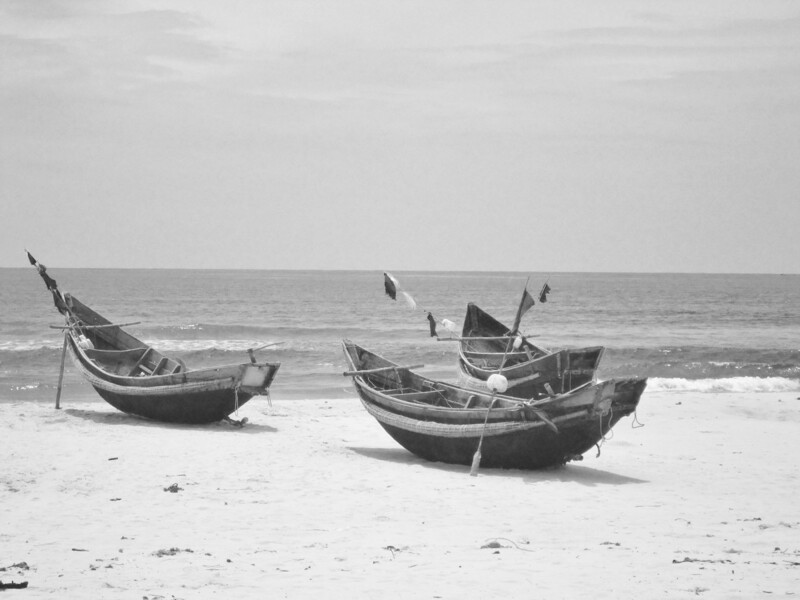 What an interesting article about the different craft villages in Vietnam. I was particularly interested in watching that lacquerware video because we have a lacquered tray with mother of pearl inlay. Now I know more about how it was painstakingly created. Very interesting and informative hub about craft villages! I have keen interest in art and crafts and would love to visit these beautiful places. Excellent pictures and well presented hub. Thanks for sharing! It would be fascinating to visit these craft villages and see the work of creative people in other cultures. You will definitely enjoy it. What is good is you can also learn to do some of the crafts. Craft villages in Hanoi must be a delightful to visit. I would love to spend several days watching different crafts create their wares. The Vietnamese have preserved their traditional crafts and have really improved these. 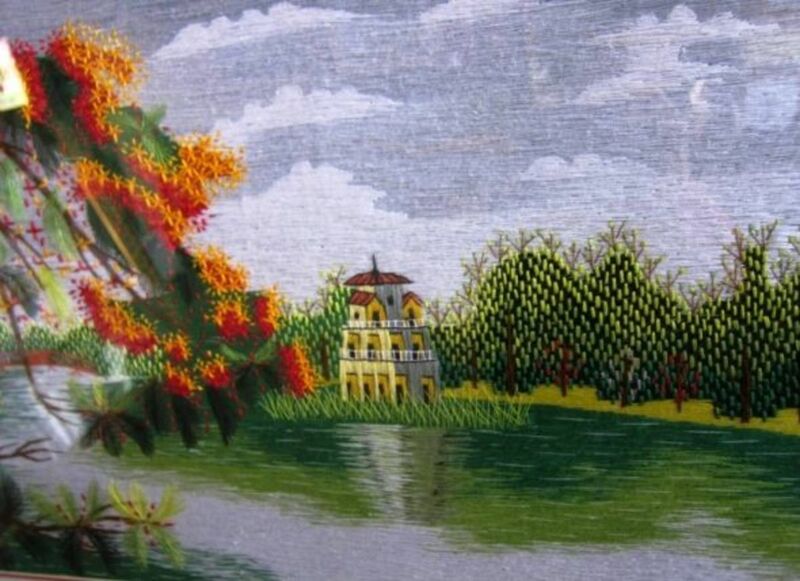 Vietnam has many talented people, very beautiful pottery and embroidery, voted beautiful? I very much appreciate the quality of hand-made items. Anyone visiting Vietnam should definitely schedule time to visit these unique artist villages. I loved the mother of pearl inlays you photographed and I hope that these artists are featuring their work on sites like Amazon and Ebay. Enjoyed and voted up and awesome! The craftmenship is amazing. These are truly talented people. I've always been extreemly interested in Asia, I enjoyed this lens very much. @LiteraryMind: They are very intricate especially the mother of pearl inlay and the embroidery. @WriterJanis2: Their craft is for the finest furniture. It's painstaking work. I love the Mother of Pearl village. It's so beautiful. These crafts are absolutely beautiful. Most of them are so intricate and delicate.